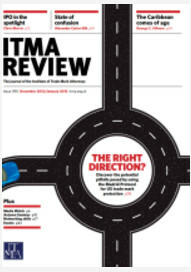 Note: I first published this article as the cover story in the Dec/Jan 2013 issue of ITMA Review, a print-only publication from the UK’s Chartered Institute of Trade Mark Attorneys. It was co-authored with Allister McManus of ipconsult. The Madrid Protocol is a tremendous tool for helping your clients secure trademark protection in other countries. In some cases, costs can be cut in half by using the Madrid Protocol. The ease of handling renewals and assignments is a further benefit— a modest fee and a single form (in English) can update trademark records in dozens of countries. As a quick review, to use the Madrid Protocol, one begins with a local trademark application (the Basic Application as filed at the Office of Origin—the IPO). The owner requests the IPO to submit the application to the World Intellectual Property Organization (WIPO) where it becomes a so-called International Registration, a supranational document that does not protect the mark in any country, but which permits WIPO to submit it to all of the designated countries. The designation of countries in which protection is desired is called a Request for Extension of Protection (REP). Each countries’ trademark office then reviews the application and (hopefully) approves it under local laws. First, if the Basic Application is abandoned or cancelled anytime during the first five years after the International Registration is issued, then all foreign applications and registrations that are based on the International Registration will automatically be cancelled as well. This is called a Central Attack. Such cancelled local marks can be converted to standard national marks, but only at significant expense and effort. Second, the owner of the International Registration cannot transfer ownership of any dependent marks to an owner that is not resident in a member country. This means, for example, that marks obtained under the Madrid Protocol cannot be transferred to a Canadian owner without first withdrawing the marks from the Madrid System at great expense. While experienced UK trademark practitioners are well-aware of the advantages and disadvantages of Madrid-based applications, they may be much less aware of additional obstacles raised under the trademark laws of the United States for applications submitted through WIPO. The remainder of this article discusses eight concerns arising under U.S. law that are specific to trademark applications filed in the U.S. through a REP under the Madrid Protocol. Marks cannot be registered in the U.S. if they are “merely descriptive” of the relevant goods and services unless the mark has acquired secondary meaning as a trade mark. Where this not possible, U.S. law provides a secondary trademark register, called the Supplemental Register, where descriptive marks can be registered without showing secondary meaning. A mark on the Supplemental Register gains some benefits of registration, including the ability to preclude other confusingly similar marks from registering. After five years on the Supplemental Register, a mark is eligible for registration on the Principal Register, where it will be accorded full legal protection. But Madrid-based applications are not eligible for the Supplemental Register. If a mark within a Madrid-based application is deemed merely descriptive, there is no possibility of moving it to the Supplemental Register as would be done with a direct-filed application. Instead, the must be abandoned and a new national application filed, incurring additional fees and losing the priority date of the Madrid-based filing. The next three points involve class designations for the goods and services within an application. The U.S.P.T.O. is known (infamous) for the specificity that it requires in a description of goods and services. For direct-filed applications, however, the Office is flexible in permitting adjustments to ensure that anything within the scope of the original language of the application can proceed to registration (barring other obstacles). Because Madrid-based applications are tied to an International Registration, however, the U.S.P.T.O. imposes several restrictions in how a description of goods and services can be amended. The first restriction is that the class numbers used within a Madrid-based application cannot be changed. For example, if a Madrid-based application lists “laminating film for inkjet paper” in class 16, the U.S.P.T.O. will reject the description because these goods belong in Class 17. Yet the Office will not permit the goods to be moved to Class 17; the application can only contain the specific class numbers that were originally submitted by WIPO. In this example, the application cannot be saved because the wording is narrowly drawn. Within direct-filed U.S. applications, it is permissible to move goods between classes to achieve correct classification. That is, any goods that are within the scope of the language of the original application may be placed within any class that is part of the application. For example, if an application included “Mattresses and mattress pads” in Class 20 and “bed sheets and duvet covers” in Class 24, the Office would permit “mattress pads” to be moved to its correct place in Class 24. But in a Madrid-based application, such moves are not permitted. In the above example, “mattress pads” would need to be deleted as not being in Class 20, even though the proper class (24) is already part of the application. A final related issue is that classes cannot be added to an application. Within a direct-filed application, it is a simple matter to pay an additional per-class filing fee to add a class to an existing application so that goods included in the originally filed application can be properly classified. This is useful in at least two circumstances. The first is where many items are listed in one class and the trademark examiner requires that an item must be moved to its proper class, but that class was not part of the original application. The applicant may pay the additional per-class fee, have that item moved to the newly added class, and the application proceeds. The second is where a client wishes to delay payment of some fees. Goods in many classes can be listed in a new application without designating any class numbers. The trademark examiner will issue an office action listing the applicable classes for the goods in the application. The client can then pay the additional per-class filing fees (or delete any unneeded goods and services) so that the application can proceed. This may allow a delay in paying the majority of filing fees for more than 9 months from the original filing date. But this option is not possible with a Madrid-based application. Considering the above example, if a Madrid-based application included “Mattresses and mattress pads” in Class 20, it is not possible to add Class 24 to the application. The only option is to delete “mattress pads” from the application. To be fair, the above three issues related to the description of goods and services are less traumatic than they might be because Madrid-based applications coming to the U.S. from the U.K. typically have more broadly worded descriptions that permit greater flexibility when submitting amendments than might otherwise be the case. For example, if a class heading has been used, then this can often be amended to include anything that would be within that class. Yet we have seen numerous instances where clients wishes to maintain certain items within a pending Madrid-based application but were forced to delete it (or abandon an application altogether) because of the challenges noted above. A Madrid-based application is submitted to the USPTO by WIPO under Section 66(a) of the U.S. Trademark Act. Direct-filed applications may be filed under one of several different filing bases, such as 1(a) for “use in commerce” applications, 1(b) for “Intent to Use” applications, and 44(d) to claim date priority to an earlier non-U.S. application. None of these filing bases can be included with a Madrid-based application, which can only list Section 66(a) as its filing basis. The practical limitation that this imposes is that a Madrid-based application has no flexibility to specify an earlier priority date under the Paris Convention, and no ability to immediately allege use of the mark in commerce, which may result in a weaker registration. In the U.S., rights in a mark arise through use of the mark in commerce. U.S. law does permit Madrid-based applications to register without first establishing use of the mark in commerce within the United States—this is one great advantage they have over direct-filed applications. Yet if a dispute arises in a U.S. court regarding a Madrid-based registration, the opposing party will seek cancellation of the mark because there is no record that the Madrid-based registration has been used in commerce in the U.S. Thus, the burden of proving use of the mark will fall on the mark owner. After a mark has been submitted to WIPO to become an International Registration under the Madrid Protocol, the mark itself cannot be changed. The U.S.P.T.O., however, allows “non-material” changes to a mark, both during prosecution and after issuance of a registration (via Section 7(e) of the Trademark Act). Examples of non-material changes include redesigned logos that adjust non-material design elements or word marks in which a hyphen or space is deleted or added. Thus, if the owner of a mark makes minor changes to the mark after the initial application is filed, the mark as used in commerce will differ from the mark as it appears in the trademark application or registration. This may be raised as an issue in any dispute proceedings. It will also impede the owner’s ability to submit an acceptable Statement of Use to the U.S.P.T.O., which may result in the registration being cancelled. We have seen cases where a word mark was registered with a space but was being used without a space; the Statement of Use was rejected because it did not match the mark as registered, so that the mark had to be amended under Section 7 before the Statement of Use could be accepted. An International Registration is subject to renewal every 10 years by filing a renewal form and appropriate fee with WIPO. This serves to renew the mark in all countries in which it is registered through the International Registration. However, the U.S.P.T.O. imposes separate and distinct maintenance rules for U.S. marks, including those obtained via the Madrid Protocol. Specifically, an affidavit to allege use of the mark must be filed between the 5th and 6th anniversary of the date of U.S. registration (not the date of filing); and between the 9th and 10th anniversary of the date of U.S. registration and every ten years thereafter. If the International Registration is renewed, but the proper affidavits are not filed directly with the U.S.P.T.O., the U.S. registration will be cancelled. Our experience has shown that these U.S. filing deadlines are often missed by non-U.S. mark owners, resulting in unintended cancellation of U.S. marks. In summary, the Madrid Protocol is a powerful tool for lowering costs and managing the maintenance of international trademark portfolios. When such portfolios include the United States, the above factors should be taken into consideration to decide whether the Madrid Protocol or direct filing in the United States will better serve the client’s needs.